Dr. James Hartwell: “The technology may help us respond to the global food security crisis”. 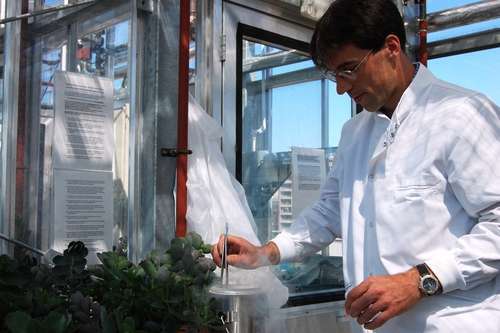 Dr James Hartwell, from the Institute of Integrative Biology, is part of an £8.6million project, funded by the US Department of Energy that aims to explore the photosynthetic mechanisms of drought-tolerant desert plants and introduce these into poplar trees. Climate change predictions suggest higher temperatures and more frequent severe weather events, including droughts, for later this century. Simultaneously, the challenge of growing enough food to feed the expanding population requires that more productive farmland is used for food production rather than bioenergy. In the face of these combined challenges, there is an urgent and pressing need to improve the ability of biofuel plants to grow productively and sustainably on marginal land that is unsuitable for major food crops. Dr Hartwell said: "The project will develop an unprecedented level of understanding of a highly water use efficient form of photosynthesis known as crassulacean acid metabolism (CAM), which is found in agaves, cacti and succulents. These plants capture carbon dioxide at night when the potential for water loss is lower. With our collaborators, we will identify the optimal 'parts-list' for CAM to function efficiently, and colleagues in the US will use this knowledge to engineer poplar trees to grow productively and sustainably in low-rainfall regions." He added: "Longer-term, it may be possible to build on our discoveries to increase the water use efficiency of other bioenergy and food crops. The technology may help us to respond to the global food security crisis by developing crops better adapted to the drier and warmer world predicted by climate change models."